Have You Ever Bounced Off A Rainbow Into An Ocean And Decided Not To Drown? On May 13th we released our 4th full length album Have You Ever Done Something Evil?. Reactions have been incredible. A sincere thank you for listening! It's out in all the usual online outlets but the only place to get the CD, and the best way to get digital (especially if you like FLAC files) is Bandcamp. 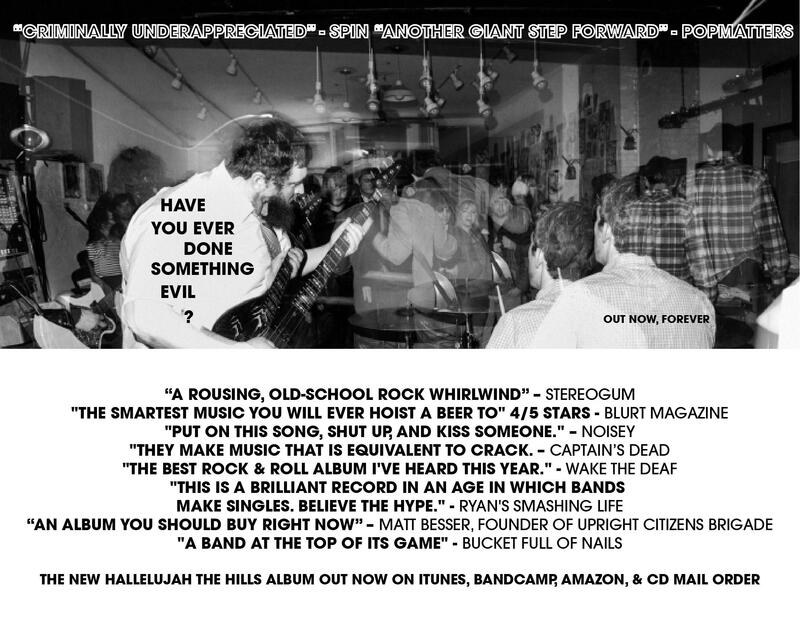 But hey, if you're on iTunes or Amazon anyway, think about leaving a review. It helps spread the word on the record. Our California tour has wrapped, and it was phenomenal. Thank you for coming out! If you're a fan of comedy podcasts, you should really check out our episode of Impov4Humans which we recorded in Los Angeles at the Earwolf studios. If you think we look a little beleaguered in these Earwolf studio pictures, there's a good reason. The night before that recording our van was smashed into while we played and they grabbed all of our personal belongings and a box of our CDs. We drove overnight to LA, halfway in a smashed in a van, the other half in a new rental, and I'm pretty sure I can't tell if I drove a leg of the trip or just dreamed I drove a leg of the trip, and that's not good. We arrived just in time to record the Improv4Humans episode. Thieves can't stop HtH (I've always said this, and I'll say it again, it will be an inside job that destroys this band)! We were very thankful that they didn't get our instruments, but we did have to improvise to find some respectable clothes to play the wedding of two lovely fans, scheduled for two days later. In a fevered, rushed trip to the Glendale Galleria, we all bought new clothes to last us the week. Walking into a Target and buying everything you need to be clothed and clean for the near future feels a little bit like entering the witness protection program. It's not ideal, but in the right circumstances, I highly recommend it. In the end, I think we ended up looking pretty sharp at that wedding. More California stories and exciting band news soon!